So you want a look into the Meerkat past? Cue up the Wayne's World flashback music please. Growing up I was not your typical teenager. In high school my life revolved around two things; softball and friends. If I wasn't training with MOH Meerkat, we were out with our friends at the beach or having a bonfire in my back yard. I never went crazy partying or out every weekend. All those typical teenager activities bored me. 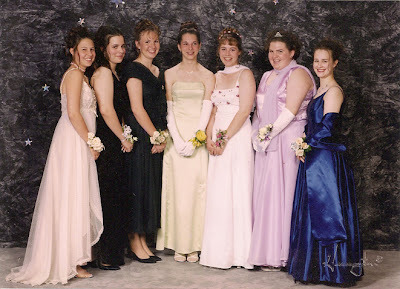 Some of our friends at prom. As far as relationships went I did a little bit of random dating here and there but nothing serious. And acedemics... HA! I did my best to do as little as possible without failing. Mostly I just wanted to play softball. I had tunnel vision where softball was concerned. It was an obsession which of course MOH Meerkat helped fuel because she loved it just as much as I did. 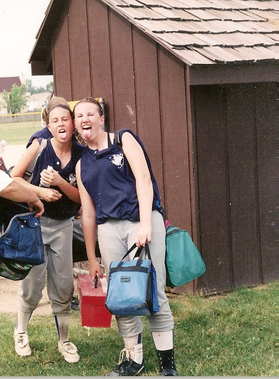 MOH Meerkat (right) and I after a softball game senior year. It wasn't until college that I realized that I was more than just an obsessed softball player. MOH Meerkat and I went to two different schools so I no longer had my softball training buddy. On top of that I randomly decided to start taking programming classes at my university's engineering college and it was love from the first line of code I wrote. Until that point I never knew I had any kind of smarts. I guess if I had actually tried to do homework in high school I might have figured it out quicker. So I quit playing softball competitively (I still play for fun) and went from jock to intellectual in a semester. College also brought about more serious dating for me. What I found out quickly was guys in the engineering college were way more intriguing than high school guys. Most were smart, fun and had a awesome sense of humor which I quickly learned was what my taste in men ran towards. And then who should walk into my life but Mr. Meerkat. He was all the things I loved; tall, handsome, smart and with a wicked sense of humor. We became good friends while coaching a kids robotics team together and a few month after we met started dating. Mr. Meerkat tickling me while Sister-In-Law Meerkat was trying to take our photo. Of course long before high school I said I would never get married but Mr. Meerkat, well hes a nester and he had other plans. 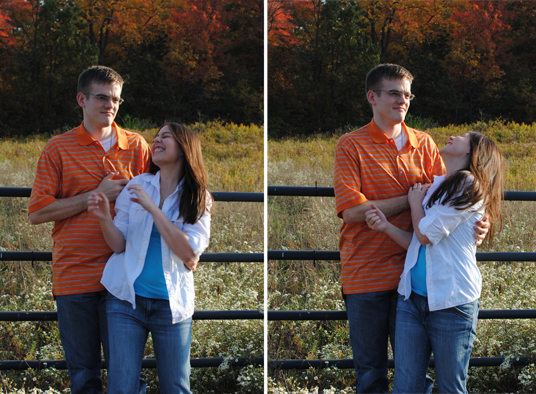 We laugh about it now but it wasn't even a year after we started dating when he told his mom that I was the girl he was going to marry. So it came as no surprise to anyone (well except me!) when Mr. Meerkat took me to Mackinac Island and proposed. Everyone was happy when we told them about the engagement and probably a little shocked too because of how adamant I was about not getting married. Showered With Love: Day of the Dead Style!